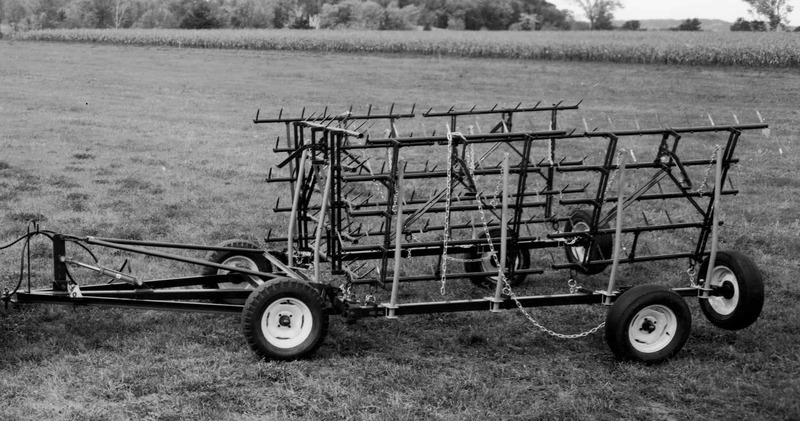 The Semi-Automatic Hydraulic Harrow Drawbar is definitely a labor saving device. To fold up the sections; simply raise them with the hydraulic cylinder, pull your tractor forward and the unit automatically folds up. To return the unit to field position; back up until the wing boom is in line with the center boom, lay down the sections with the hydraulic cylinder and youre ready to harrow. Now, if you so desire, you can save around $400 by omitting the HD-1100B Automatic Pull Cable Kit. This will make the unit Semi-Automatic, which means you will have to get off the tractor to unhook the pull cables before opening the unit, and hook them back up before putting it into transport mode. This is an option, but we truly feel your needs are best served with the Automatic Kit. The outer two sections on each side fold back. The unit is one section wide in transport position. The outer three sections on each end fold back. The unit is one section wide in transport position. Wheel spacing on the cart is adjustable from 72″ to 88″ center-to-center of tire. Five-Section, with 15 DC Wheels. Width 280 to 35. 3 sq. High Strength Tool Bar. Seven-Section, with 15 DC Wheels.